How To Conquer Depression By Lightning Your Inside Fire - Motivate Amaze Be GREAT: The Motivation and Inspiration for Self-Improvement you need! In simple words, the study suggests that the emotions you feel trigger some body regions to feel in a certain way. The study made the 701 participants point out different body regions and their body sensations in a scale (from +15 to -15) while feeling particular emotions. The result was this map you can see on the left of your screen. The scale uses colors. 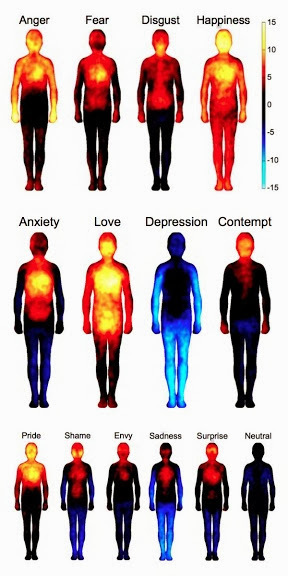 Notice the color they use to describe each emotion and the body region most affected. It's curious to see that depression it's the most distinguish of them with blue colors, the lowest of the scale they created. Other emotions always revolver around the red/yellow higher scale colors. So...emotions trigger your body regions to feel a certain way. Can your body movements in those regions trigger your mind to feel those same emotions too, like say it in reverse way? Sure! When you feel happy: you're full of energy your body it's in a strong confident position. When you feel depressed: your body is no longer in a strong position, it's probably curved and weak, you feel discouraged. The concept here it's very easy and it will astonish you! If you are feeling blue (depressed, sad, shame, neutral) simply light up your inner fire (move your body) and you'll be feeling red/yellow (happy, love, pride, etc) in a nick of time. Example: Actually you have experienced this before, in a bad way, but you did! In fact we all did! Remember a time when you were kind of feeling sad, and some "annoying" person reach out for you, and your reaction was just to yell and scream like "GET OUT OF HERE!"? Did you feel sad (and blue) immediately after this? Of course no you felt anger and that blue state in a split second became energy to scream and yell and your emotions changed. So if a great charge of energy can change your emotions to a angry state, it can also change it to a happy state. You don't need to yell and scream looking like a mad bully, just move your body in a energetic and confident way even if you don't feel like it. This fact is explained by the actions hormonal production has in our bodies. When you move your body you are inducing the endocrine system to secrete hormones directly into the bloodstream and this changes the way you feel. There's plenty of ways to trigger the endocrine system to secret those hormones. You can mix all the good options in one and you'll have an EXCELLENT OPTION: engage in physical activity while you listen to music, thinking about good moments, make the noises you want out laud, talk to yourself in a positive way! It's guaranteed if you do the Good and Excellent options, you'll change that blue state to a yellow/red fire emotion in a split second without secondary negative effects, and even better... that emotion will last longer and longer the more you make this an habit! And you will conquer depression! You'll feel good and you'll be addicted to it, a good addiction! So being depressed or being happy becomes a matter of choice, YOUR CHOICE! Don't let negative situations in your life discourage you, it's the way you react to them that really dictates the emotions you will feel. So make the decision to be happy, and put your body and mind in the right position to feel those positive emotions. Depression will become a memory not your reality.